Added 67 mi of city streets to the state highway system. Required that the state maintain highways in cities. This was a significant shift for the previously rural-oriented Division of Highways. Raised the gasoline and diesel fuel tax to 4.5 cents per gallon. Increased automobile registration fees from $3 to $6, with a proportionate increase in the weight taxes on trucks. Created a fund for all highway revenues and motor vehicle taxes. Revised apportionment of revenues from fuel taxes to cities, counties, and the state. Directed gasoline tax and registration fee revenues toward construction of freeways in urban areas and highways in rural areas of the state. Divided state highway construction funds with 55% allocated to the southern half of the state, and 45% to the northern half of the state. This was a significant shift from the previous 49%/51% allocation. This also provided minimum funding for each county. Gasoline fees were again increased in 1953, 1963, 1983, 1989, 1990, 1992, 1993, and 1994, to an ultimate tax of eighteen cents per gallon. The Division of Highways was reorganized to deal with the greater volume of work the act generated. The 1947 Statutes (PDF, 173.8 MB) and 1st ex session statutes (PDF, 2.9 MB) made the following changes. Note that the California Legislature appears to have skipped from LRN 210 (route defined in 1939, number assigned in 1943) directly to LRN 221. The routes from LRN 221 to LRN 229 were added by 1st Ex Session Chapter 11. Later acts that year created LRN 212, and LRN 213. Additional backfilling of the skipped numbers was done in 1949 (LRN 214), 1959 (LRN 216), and 1961 (LRN 218). LRN 52 CA 131 CA 131 Extend Change terminus from "Alto" to "[LRN 1]". LRN 68 Bypass US 101 US 101 Extend Changed southern end to "[LRN 2] near Ford Road S of San Jose", and delete the paragraph relating to the Bay Bridge. LRN 68 CA 17 I-580 Extend In 1947, Chapter 1233 removed the Bay Bridge approaches, and added the following third segment: "Route (b) above near Buchanan Street Extension in Albany to a point in Western Drive approximately 1,900 feet northwesterly of Scofield Avenue, Richmond. LRN 158 CA 7 I-405 Extend Extend from Culver City (Route 90) to Long Beach (Route 710), reflect LAX name change: "(a) [LRN 4] near San Fernando to [LRN 60] near Mines Field Los Angeles Airport(b) [LRN 60] near Los Angeles Airport to a point on [LRN 167] near Signal Hill"
CA 134 Extend Extend (Los Angeles (US 101) to Colorado Street in Glendale (Route 134), Freeway routing) and clarify: "(a) [LRN 205] near Elysian Park in Los Angeles to a connection with [LRN 4] near Glendale. (b) [LRN 2] near Vineland Avenue Cahuenga Park to [LRN 4] near Glendale Burbank(c) [LRN 4] near Glendale to [LRN 9] near Monrovia"
CA 159 Simplify Simplify the definition to drop any specific routing: San Pedro to "[LRN 9] near La Canada via Figueroa Street and Linda Vista Avenue". LRN 167 CA 15 CA 7 I-710 Clarify Introduce a discontinuity at (former) Route 245/US 101: "(a) Long Beach to [LRN 166]; (b) (a) above, near Los Angeles River to [LRN 26] via Atlantic Boulevard"
LRN 172 US 60 CA 60 Clarify Change origin to be "[LRN 2] in Los Angeles". LRN 196 CA 78 CA 78 Clarify Change terminus to remove the reference to [LRN 77]: "…to [LRN 77] near Vista"
The route number LRN 211 was never assigned. LRN 213 US 99 (none) Define Define: “to parallel approximately but not coincide with [LRN 4] near the northerly city limits of San Fernando to a point on said route near the southerly limits thereof”. Note: This route was added with no number. LRN 213 was assigned in 1949. (1964-1965) (none) Define Define: “[LRN 165] near Adams Street to [LRN 205] near Elysian Park in Los Angeles”. (1968-1972) I-80 (none) Define Define: “a point on [LRN 2] near Division Street to [LRN 56]”. LRN 224 I-480 CA 480 (none) Define Define: “a point on [LRN 2] near the intersection of Lombard Street and Van Ness Avenue to the San Francisco-Oakland Bay Bridge approach in San Francisco”. LRN 225 I-280 I-280 Define Define: “a connection between [LRN 56] and [LRN 2] near the south boundary of the City and County of San Francisco”. Extend to include “the highway from San Leandro to Oakland via Alameda and the Posey Tube”. Note: This definition encompasses segments that used to be LRN 69, when LRN 69 was rerouted to the Nimitz Freeway routing, between the same two endpoints. LRN 229 CA 186 I-380 Define Define: “a connection between [LRN 68] and [LRN 2] near San Bruno”. LRN 230 CA 165 (none) Define Define: “[LRN 172] to [LRN 173] via Indiana Street in Los Angeles County”. *: Chapter 1446 in 1947 mistakenly added a segment of LRN 226 as LRN 252. 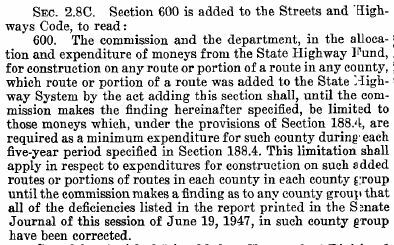 This was corrected in 1949, and LRN 252 wasn't really created until 1959. CA 96 Change Change origin to "a point on [LRN 3] near the Klamath River Bridge"
LRN 62 CA 39 CA 39 Change Remove the segment from [LRN 2] (US 101) to [LRN 26] (US 70). LRN 105 CA 92 CA 92 Extend Combine the first two segments into "[LRN 56] near Half Moon Bay to [LRN 5] near Hayward". This was part of an act that authorized the acquisition and operation of the San Mateo-Hayward Bridge, and that they shall be operated as state highways. This change became effective once the California Toll Bridge Authority acquired the bridge. LRN 107 CA 84 CA 84 Extend Change the definition to include the Dumbarton Bridge, making the terminus of segment (b) "[LRN 68] near Palo Alto". This was part of an act that authorized the acquisition and operation of the Dumbarton Bridge, and that they shall be operated as state highways. This change became effective once the California Toll Bridge Authority acquired the bridge. LRN 144 CA 202 CA 202 Clarify Change "Old Town" to "Tehachapi". LRN 160 CA 170 CA 170 Clarify Clarify routing: "Highland Avenue, Los Angeles from Cahuenga Blvd [LRN 2] to Santa Monica Blvd [LRN 162]"
LRN 167 CA 15 I-710 Extend Combine segments and extend to [LRN 205] (Pasadena Freeway): "Long Beach to [LRN 205] in South Pasadena"
LRN 4 CA 4, US 99 CA 4 Transfer Transfer the Charter Way and Mariposa Road routings in Stockton to LRN 75 when the Stockton Bypass was constructed. LRN 53 CA 12 CA 12 Clarify Change "Fairfield" to "[LRN 7] near Fairfield". LRN 64 US 395 CA 74 CA 74 Extend Extend (a) to terminate at LRN 78 near Perris. CA 4 Clarify Change “[LRN 5] near Stockton” to “[LRN 4] near Stockton”. LRN 77 CA 78 US 395 CA 78 Reroute Changes to LRN 196 make it appears as if a 1933 routing of LRN 77 from Vista to Escondido was transferred this year to LRN 196. There were no actual changes to the text of LRN 77 itself. LRN 135 CA 43 CA 43 Clarify Rewrite: "[LRN 10] at near Hanford, thence southerly in the vicinity of via Corcoran and Earlimart to [LRN 129] near Ducor"
LRN 154 CA 232 CA 232 Extend Add LRN 60 to LRN 2: "(a) The junction of [LRN 60] and Saviers Road in Ventura County, along the route of said road to [LRN 2] near El Rio." LRN 158 I-405 I-405 Extend Combine the segments and extend the route from the Long Beach Freeway to the El Toro Y: "[LRN 4] near San Fernando to [LRN 2] in the vicinity of El Toro; provided, however, that Section 600 of this code shall be applicable to that portion of said route southerly of [LRN 167] near Signal Hill the same as if said portion had been added by the Collier-Burns Act of 1947, and the Department of Public Works shall not be required to maintain any portion of said route until the same has been laid out and constructed as a state highway"
LRN 159 CA 170 Reword Truncat and clarify the definition to be "[LRN 2] near Vineland Ave to [LRN 4] near Tujunga Wash"
LRN 167 CA 15 CA 7 I-710 Truncate Truncate to Huntington Drive: "… to Huntington Drive." US 101 CA 39 Truncate Change the terminus: "… to [LRN 2] near Whittier [LRN 62] at or near Buena Park"
LRN 181 Unknown (none) Delete Delete routing: "[LRN 43] to [LRN 176] near Yorba Linda via Grand Avenue and Glassell Avenue"
LRN 183 Unknown (none) Delete Delete routing: "[LRN 60] near Seal Beach to [LRN 2] near Santa Ana"
LRN 196 CA 78 CA 78 Extend Extend from Vista to Escondido: "…to Vista [LRN 77] near Escondido"
LRN 232 CA 24 (none) Number Correct number: [LRN 207] -» [LRN 232]. In 1953, the gasoline tax was increased from 4.5 to 6 cents per gallon. At the same time, the other highway users taxes were increased by a third. LRN 14 US 40 CA 123 Truncate Change terminus from "Martinez" to "[LRN 7] near Crockett"
LRN 15 CA 20 CA 20 Extend Change origin to “[LRN 56] near Fort Bragg”. Added non-substantive language about Section 600. LRN 40 CA 167 CA 167 Extend US 395 N of Mono Lake to the Nevada line, in the vicinity of the Pole Line Road. LRN 74 CA 29 CA 29 Clarify Made the clause about the Benecia Ferry contingent on the acquisition by the Department of Public Works of the ferry system operated across the Carquinez Straights between the cities of Benecia and Martinez. CA 28 Clarify Reworded segment (b)  to be “Route (a) above, north of Walnut Creek to a connection with [LRN 74] in Benecia”. Mistakenly deleted (c), from [LRN 4] near Stockton to [LRN 65]. This change was contingent on the acquisition by the Department of Public Works of the ferry system operated across the Carquinez Straights between the cities of Benecia and Martinez. I-15 Relax Change the definition of (a) to drop the specific routings on Valley Boulevard and Pomona Boulevard. LRN 105 CA 185 CA 185 Truncate Truncate the definition of (b) [former (c) from "Seventh and Cypress Streets in Oakland" to "High Street in Oakland"
LRN 119 CA 25 CA 25 Clarify Clarify the origin and relax the terminus: "[LRN 2] near Gilroy to [LRN 10]". LRN 135 CA 43 CA 43 Extend Change the terminus and routing: "[LRN 10] near Hanford, thence southerly in the vicinity of Corcoran and via Sun Rise City to the junction of [LRN 33] and [LRN 139] near Wasco Earlimart to [LRN 129] near Ducor". LRN 160 CA 170 CA 180 Extend Eliminate the specific routing: "Highland Avenue, Los Angeles from [LRN 2] to [LRN 162]in the Hollywood Area, Los Angeles"
LRN 178 Rewrite Rewrite: "Lakewood Boulevard Cerritos Avenue to Manchester Avenue via Carson-Lincoln [LRN 43] near Olive via Anaheim"
LRN 202 CA 98 CA 98 Extend Combine the segments and change origin: "[LRN 12] near Coyote Wells [LRN 12] near Seeley to [LRN 27] near Midway Wells via Calexico"
LRN 209 CA 151 CA 151 Rewrite Rewrite: "[LRN 3] near Project City Station 398, according to the survey of said [LRN 3], Section B, to Shasta Dam Summit near Summit City"
Note: This is the real LRN 233. LRN 235 CA 77 CA 77 Define Define (as LRN 233): “(a) High Street, Oakland, between [LRN 69] and [LRN 5]; (b) [LRN 227] near the intersection of Park Boulevard, Oakland to [LRN 75] near Lafayette”. Note: In 1957, this was renumbered as LRN 235. In 1955, the legislature extended the 1953 gasoline tax increases to 1960. LRN 15 CA 20 CA 20 Clarify Removed non-substantive language relating to Section 600; no change in routing... which was removed later that year. CA 211 Clarify Remove the language related to Section 600. Reword the definition of the last segment to be "State highway near southerly end of Marin Peninsula to [LRN 1] near Fernbridge via the coast route through Jenner, Westport, and Ferndale, including lateral connection with [LRN 1] near Leggett Valley "
I-5 Extend Extend and rework: "(a) [LRN 41] near Mendota to [LRN 10] near Oilfields. (b) [LRN 10] near Coalinga to [LRN 57] near Maricopa. (c) [LRN 2] in Ventura to [LRN 57] in Cuyoma Valley." LRN 158 CA 7 I-405 Other Remove the language relating to section 600 (actually, it just made that language a general condition as Section 2109 of the code). LRN 212 CA 178 CA 178 Other Reiterate definition; indicate that Section 600 is applicable. Remove the language relating to Section 600. I-980 Other Add: "526.1 Upon the completion of the additional subterranean tube between the Cities of Oakland and Alameda, in the vicinity of Webster Street, to be used in connection with the Posey Tube, both of which tubes are included in the description of [LRN 226], the department may by executive order, rule, or regulation, designate both of said tubes, and the approaches leading to or from the nearest state highway or city street, as one-way highways, and thereafter restrict said tubes and approaches to one-way traffic, proceeding in opposite directions as to each other. Upon the placing of signs notifying the public of such restrictions, any person who wilfully fails to observe such sign is guilty of a misdemeanor." LRN 232 CA 24 (none) Other Remove the Section 600 language. LRN 233 CA 49 CA 49 Other Remove the Section 600 language. 1956 saw the passage of the 1956 Federal Aid Highway Act, which created the 40,000 mi National System of Interstate and Defense Highways. The funding level for this undertaking was established at $25,000,000,000 over a thirteen year period, with increased funding for primary and secondary highways. The primary source was a 3¢ per gallon federal gasoline tax. Funds from this tax, along with funds from other federal highway user fees, were deposted into a "Highway Trust Fund". The federal share of Interstate construction costs was set at 90%, compared to the previous 50% rate. LRN 237 CA 117 I-280 Define Define: “Junipero Serra Boulevard as it exists and as it was constructed by Joint Highway District No. 10 from its junction with [LRN 56] in Daly City to the present terminus of said highway in the City of San Bruno.” Joint Highway District No. 10 was also dissolved at this time. The system must connect the state's major centers of population. The system must connect the state's primary centers of industrial activity and natural resources both with its centers of labor and materials and with its major shipping points. The system must provide access to important military installations and defense activities. The system must provide access to major recreational regions; national parks and monuments, and state beaches and parks; lakes; hunting and fishing areas; and to state institutions. The system must connect as many seats of county government as is economically feasible. The system must provide for continuity of travel into, through, and around urban areas from rural freeway approaches. The system must provide for large traffic movements between population and industry centers within urban areas. The system must provide the necessary capacity within the traffic corridor. The system must connect with major highways of adjacent states. The system must constitute an integrated system, with a minimum of stubs or spurs, to permit general traffic circulation. I-210 Clarify In segment (a) change "[LRN 2] near Montalvo" to "[LRN 79] near Saticoy", and in (b) "San Fernando" with "Near San Fernando"
LRN 17 US 40 CA 49 CA 49 Clarify Change origin to "[LRN 3] S of Roseville"
LRN 24 CA 49 and other routes CA 49 and other routes Clarify Delete reference to Vallecita. CA 36 Other Give priority for federal funds received. LRN 37 US 40 I-80 Simplify Change to "Auburn to [LRN 38] via Emigrant Gap." LRN 45 CA 162 Simplify Simplify the definition to terminate at "[LRN 7] near Willows." LRN 56 CA 1 CA 1 Simplify Delete the reference to "Carmel" from segment (b). LRN 59 CA 2 CA 138 Simplify Combine the first three segments, giving "[LRN 4] near Gorman to [LRN 31] near Cajon Pass"
US 101A CA 1 Simplify Delete "via Oxnard". LRN 61 CA 2 CA 2 Simplify Combined segments and simplify to "[LRN 162] near Avenue 36 (i.e., Route 2 slightly NE of US 99) in Los Angeles to [LRN 59] (Route 138) via Glendale and Wrightwood." CA 17 Reroute Delete segment (c) and clarify (b) to "San Jose to the Richmond-San Rafael Toll Plaza"
LRN 71 US 101 US 101 Clarify Change terminus to the "Oregon State Line"
CA 28 Clarify Change "[LRN 74] at Benecia" to "near Benecia". LRN 79 CA 126 US 99 CA 126 Clarify Change terminus to "[LRN 23] near Solamint". Business Route 80 Clarify Change terminus to "[LRN 3] near N Sacramento". LRN 106 CA 4 CA 4 Clarify Change LRN 14 to LRN 7, and clarified the terminus as being "north of Concord"
LRN 110 CA 132 I-580 Extend Change origin from LRN 41 to "[LRN 5] near Tracy"
LRN 137 CA 229 CA 229 Extend Change origin: "[LRN 58] [LRN 2] near Santa Margarita to …"
LRN 154 CA 232 CA 232 Truncate Remote north of [LRN 9] (Route 118), simplify the origin, and eliminate the discontinity: "[LRN 60] near El Rio to [LRN 9] near Saticoy." LRN 159 CA 170 Clarify Change origin: "[LRN 2] near Riverside Drive to …"
LRN 162 US 66 CA 2 Clarify Delete east of LRN 61: "[LRN 60] near Santa Monica to [LRN 61] near Avenue 36"
LRN 164 CA 107 CA 107 Clarify Clarify: "[LRN 60] near at Torrance via Hawthorne Avenue to [LRN 158] near Culver City". LRN 170 CA 35 CA 24 I-605 Extend Extend to originate at [LRN 60]: "[LRN 179] [LRN 60] near Seal Beach to …"
LRN 172 US 60 CA 60 Clarify Simplify terminus: "…to [LRN 19] near Walnut Station". LRN 173 CA 26 I-10 Clarify Change terminus: "… to [LRN 166] near Downey Road [LRN 2] near Soto Street"
LRN 174 CA 10 CA 42 Truncate Delete (b) ([LRN 2] near Orange County Hospital to Main Street, Santa Ana via Santa Ana Boulevard); change origin of (a): "[LRN 60] west of Inglewood via Manchester Avenue to [LRN 2] near Miraflores". Clarify terminus: "… to [LRN 2] near Santa Ana". LRN 179 CA 22 CA 22 Extend Change end of route to "[LRN 43] near Orange"
LRN 182 CA 22 Former part of CA 22 Truncate Change origin from [LRN 2] to [LRN 43] near Orange"
CA 38 Clarify Delete the specific routing via Highland Avenue from segment (a). I-110 Clarify Relax routing: "[LRN 165] near Los Angeles River in Los Angeles to [LRN 161] in Pasadenaat Broadway Avenue"
LRN 227 CA 13 CA 13 Clarify Relax routing: “a connection between [LRN 75] near Lake Temescal in Oakland and [LRN 5] near San Leandro”. LRN 235 CA 77 CA 77 Number; Clarify Renumber the 1953 Chapter 1787 definition of LRN 233 as LRN 235. Rewrite (a): "(a) A connection with [LRN 69] near 42d Avenue to a connection with [LRN 5] near High Street in Oakland"
LRN 238 I-5 I-5 Define Define: “to extend from a point on [LRN 4] south of Bakersfield to a point on [LRN 7] near Woodland, on a route along the westerly side of the San Joaquin Valley to be selected by the California Highway Commission, which route may include all or portions of any existing state highway route or routes”. I-710 Extend Add the San Pedro-Terminal Island Bridge: "[LRN 165] in San Pedro to Huntington Drive via Long Beach, and including a bridge with at least four lanes from San Pedro at or near Boschke Slough to Terminal Island"
It is the purpose of the legislature in extending lengths of routes presently in the State Highway System and in adding routes to the State Highway System in this act that additional mileage be incorporated into the State Highway System in order that said mileage may become a part of the California Freeway and Expressway System. There shall be no expenditures made on the extensions of state highways added by this act or on any state highways added by this act other than planning, design, maintenance, right-of-way acquisition and right-of-way clearance until the 1963-64 Fiscal Year. Note: The connection was deleted because it was redundant with LRN 275, defined by Chapter 1062, which ran from LRN 26 to LRN 190 (Route 30). Note: the original LRN 30 was defined in 1909 but the routing was abandoned... but this routing appeared to duplicate the 1959 extension of Route 193. CA 36 Other Adjust priority funding language. LRN 47 CA 32 CA 32 Clarify Change [LRN 7] "at Orland" to "near Orland"
LRN 51 CA 12 CA 12 Extend Extend to Route 1 [LRN 56] on one end, and Sonoma on the other. LRN 56 CA 1 CA 1 Clarify Change segment (a) to refer to "the vicinity of Lompoc and Guadalupe." LRN 62 CA 39 CA 39 Extend Restore the gap: "[LRN 171] near Buena Park to [LRN 61] via San Gabrial Canyon." CA 17 Extend Add a "a connection to LRN 5 near Warm Springs" to (b), and extend (a) to [LRN 56] near Point Reyes Station. Also, swap the two segments. LRN 74 CA 29 CA 29 Extend Extend the route to begin at [LRN 6] near Napa, and removed the contingency regarding the Benecia Ferry. US 6 Clarify Change segment (c)  to be “[LRN 125] near Fresno”. LRN 88 CA 45 CA 45 Extend Change the origin of the first segment to "[LRN 15] near Colusa". CA 104 CA 124 Extend Add "a connection to [LRN 34] south of Ione". LRN 104 CA 128 CA 128 Clarify Change definition to "[LRN 1] near Geyserville to [LRN 49] near Calistoga". LRN 109 CA 108 CA 108 Extend Change origin to “[LRN 238] near Crows Landing”. LRN 110 (See Below) Change origin from "[LRN 5] near Tracy" to "[LRN 75] near Brentwood", and explicitly add a connection to "[LRN 238] southwest of Vernanlis". CA 239 CA 239 Extend I-580/I-205 junction to Route 4, appearing to follow the route of County Route J4. LRN 114 CA 85 CA 85 Extend Change origin to [LRN 5] (Route 17). LRN 115 CA 130 CA 130 Extend Change definition to "(a) The intersection of [LRN 5] and [LRN 239] near Moorpark Avenue to [LRN 68] near Story Road. (b) [LRN 68] near San Jose to Mount Hamilton". This reflected a change in routing. Extend (b) to "Patterson via Mount Hamilton"
LRN 122 CA 140 CA 140 Extend Add the segment from I-5 near Gustine to Route 33 and eliminate the specific routing, giving: "[LRN 238] near Gustine to [LRN 4] near Merced". CA 136 Extend Clarify and reroute: (a) [LRN 4] near Tipton to [LRN 31] near Baker via the vicinity of Porterville, Camp Nelson, Olancha, Death Valley, and Death Valley Junction. (b) From [LRN 23] near Lone Pine to a junction with the route described in part (a). LRN 135 CA 43 CA 43 Extend Extend from Route 198 to Route 99. Rewrite definition to add segment. "(a) The junction of [LRN 33] and [LRN 139] near Wasco to [LRN 10] near Hanford(b) The Kings County Line north of Hanford to [LRN 4] near Selma"
CA 223 Clarify Change (b) to eliminate the specific routing (i.e., "…to [LRN 58] via Arvin"). LRN 143 CA 184 CA 184 Clarify Delete "near Loma Park": "… to [LRN 57] near Loma Park". LRN 146 CA 78 CA 78 Extend Extend (a) from Route 86 near Brawley to Palo Verde (Riverside County line): "County Line near Palo Verde [LRN 187] east of Brawley to …"
LRN 153 CA 34 CA 34 Clarify Delete the specific routing: "…near Somis via Oxnard and Camarillo". LRN 156 CA 27 CA 27 Clarify Clarify: "[LRN 60] near Topanga Beach but north of the intersection of Sunset Boulevard and [LRN 60] to [LRN 9] at or near Chatsworth"
LRN 160 CA 170 CA 170 Extend Clarify and extend (Route 2 to I-405): "[LRN 158] near Inglewood to [LRN 2] in Los Angeles to [LRN 162] in the Hollywood Area, Los Angeles"
I-710 Extend Extend to I-210: "[LRN 165] in San Pedro to Huntington Drive [LRN 9] in Pasadena via Long Beach, and including a bridge with at least four lanes from San Pedro at or near Boschke Slough to Terminal Island"
LRN 169 CA 218 CA 218 Define New definition: "[LRN 56] to [LRN 117] via Canyon Del Rey." LRN 170 CA 35 CA 243 I-605 Extend Extend I-10 to I-210: "… to [LRN 26] near West Covina [LRN 9] near Duarte." LRN 186 CA 79 (none) Redefine LRN 194 (Route 79) to LRN 19 (US 60) near Moreno. CA 247 Clarify Extend (a) to "[LRN 43] near Lucern Valley via Monongo Valley", and correct the spelling of White Water. LRN 190 CA 83 CA 83 Clarify Relax the routing: "[LRN 77] via Euclid Avenue to [LRN 190] in Upland"
LRN 193 CA 31 I-15 Extend Relax routing and extend: "[LRN 43] at near Corona northerly to [LRN 19] [LRN 31] near Devore." LRN 194 CA 79 CA 79 Reroute Change ends and relax routing: "[LRN 19] near Moreno [LRN 78] east of Temecula to [LRN 78] near Aguanga [LRN 26] near Beaumont via the vicinity of Hemet". LRN 206 CA 13 CA 13 Extend Extend from I-80 near Emeryville to Route 61; eliminate Bay Bridge language: "[LRN 257] near Emeryville to [LRN 75] near Lake Temescal"
LRN 210 CA 161 CA 161 Extend Split and extend: "(a) [LRN 28] near Canby to the Oregon line near Hatfield. (b) From a point on the highway in segment (a) near Hatfield to [LRN 72] near Dorris." LRN 216 CA 139 CA 139 Define Define: “[LRN 20] north of Susanville to [LRN 28] near Adin”. LRN 241 I-880 I-880 Define Define: “[LRN 2] near San Ysidro to [LRN 2] near the northwest boundary of the City of San Diego, easterly of existing [LRN 2]”. LRN 243 CA 29 CA 29 Define Define: “[LRN 89] south of Kelseyville to [LRN 49] near Lower Lake”. LRN 246 CA 102 CA 102 Define Define: “[LRN 238] near Elkhorn to [LRN 17] near Auburn”. LRN 249 CA 65 CA 65 Define Define: “[LRN 10] near Exeter to [LRN 17] near Roseville on a route along the easterly side of the San Joaquin Valley to be selected by the California Highway Commission, which route may include all or portions of any existing state highway route or routes”. LRN 252 CA 37 CA 37 Define Define: “[LRN 69] near Nicasio to [LRN 1] near Novato”. LRN 260 CA 235 CA 235 Define Define: “[LRN 238] to [LRN 4] north of the Calaveras River”. LRN 261 CA 234 County Route J9 CA 234 Define Define: “[LRN 238] near French Camp to [LRN 4]”. LRN 262 CA 68 CA 68 Define Define: “Asilomar Beach State Park to [LRN 56]”. LRN 263 CA 180 CA 180 Define Define: “[LRN 119] near Paicines to [LRN 41] near Mendota”. LRN 264 CA 223 CA 223 Define Define: “[LRN 238] to [LRN 4] south of Greenfield”. LRN 265 CA 64 CA 64 Define Define: “[LRN 60] near Malibu Beach to [LRN 4] south of San Fernando”. CA 112 Define Define: “[LRN 9] near Sunland to [LRN 58], including a connection to [LRN 61] north of La Canada”. LRN 267 CA 48 CA 48 Define Define: “[LRN 59] to [LRN 266] near the San Bernardino county line”. LRN 268 CA 18 CA 18 Define Define: “[LRN 59] to [LRN 43]”. LRN 272 CA 57 CA 57 Define Define: “[LRN 19] near the City of Industry to [LRN 26] near Pomona”. LRN 274 CA 142 CA 142 Define Define: “[LRN 77] near Chino to [LRN 190] near Upland”. Note: This was a transfer of the Colton-San Bernarndino connection from LRN 26. LRN 276 CA 81 CA 81 Define Define: “[LRN 78] east of Riverside to [LRN 193] south of Devore”. LRN 277 CA 71 CA 371 Define Define: “[LRN 78] east of Temecula to [LRN 65] east of Anza”. LRN 278 CA 56 CA 56 Define Define: “[LRN 2] north of La Jolla to [LRN 198]”. LRN 279 CA 52 CA 52 Define Define: “[LRN 2] east of La Jolla to [LRN 198] near Santee”. LRN 280 CA 54 CA 54 Define Define: “[LRN 2] near Sweetwater River to [LRN 2] near El Cajon”. LRN 284 CA 171 (none) Define Define: “[LRN 2] to [LRN 241] via Switzer Canyon”. LRN 287 CA 100 CA 100 Define Define: “[LRN 5] to [LRN 56] via Ocean Street, Second Street, and Chestnut Street in Santa Cruz”. LRN 288 CA 244 CA 244 Define Define: “[LRN 3] to [LRN 249] near Fair Oaks”. LRN 289 CA 87 CA 230 Define Define: “easterly of the Bayshore Freeway from San Jose to the highway described in subdivision (a) of Section 553.1, the Hunters Point Freeway”. LRN 290 CA 14 CA 14 Define Define: “[LRN 60] northwest of Santa Monica to [LRN 4] near Tunnel Station”. The Winter Olympics in Squaw Valley served as impetus to build I-80. I-80 became the first all-weather, trans-Sierra Nevada highway and was nationally recognized as a major engineering achievement. LRN 15 CA 20 CA 20 Clarify Delete the paragraph about the bridge between Sutter and Colusa counties. LRN 16 Unknown CA 175 Clarify Change terminus to "[LRN 89] near Lakeport"
US 395 Clarify Change "Meyers Station" to "Meyers"
LRN 54 CA 16 CA 16 Clarify Change the terminus to "[LRN 65] near Drytown" and eliminate routing language. LRN 66 CA 120 CA 120 Extend Combine segments and changed the western end to Route 238: "[LRN 238] near Mossdale to [LRN 13] near Oakdale via the vicinity of Manteca." LRN 68 Bypass US 101 US 101 Extend Change terminus to "[LRN 5] near Oakland" (which by definition extended the route over the Bay Bridge). US 6 Nothing No changes appear to have been made by the amendment. LRN 99 CA 84 CA 84 Clarify Relax origin to be "[LRN 53] near Rio Vista". LRN 105 CA 185 CA 185 Clarify Relax the definition of (b) to simply originate in "Hayward". LRN 114 CA 85 CA 85 Extend Change origin to "[LRN 2] near Ford Road." LRN 116 CA 9 CA 9 Clarify Change origin to "[LRN 5] near Santa Cruz". LRN 121 CA 33 CA 33 Clarify Change terminus to simply "[LRN 41]". LRN 163 CA 187 Clarify Extend to Route 173: "… to a connection with Windward Avenue in the city of Los Angeles LRN 173 via Pacific Avenue and Venice Boulevard"
LRN 183 CA 147 CA 147 Redefine Add: "[LRN 83] near Canyon Dam to [LRN 29] near Westwood"
LRN 184 CA 73 CA 73 Split Split at [LRN 158]: "(a) [LRN 60] near Corona Del Mar to [LRN 158]; (b) [LRN 158] to Santa Ana via Main Street"
LRN 213 Business Route 5 (none) Clarify Add condition that LRN 213 would “cease to be a state highway when the commission relinquishes that portion of the present [LRN 4] in the City of San Fernando upon the relocation of [LRN 4] outside of the City of San Fernando”. LRN 272 CA 57 CA 57 Extend Change terminus: “…to [LRN 26] near Pomona [LRN 240]”. CA 905 Clarify Change "[LRN 277]" to "[LRN 278]"
LRN 287 CA 100 CA 100 Reword Reword: “The junction of [LRN 5] and [LRN 56] via the beach area in Santa Cruz to [LRN 56] west of the San Lorenzo River via Ocean Street, Second Street, and Chestnut Street in Santa Cruz”. LRN 291 CA 213 CA 213 Define Define: “[LRN 158] near Western Avenue to 25th Street in San Pedro”. LRN 294 ==> ==> ==> ==> LRN 294 was defined in 1963, but the change did not take effect due to the great renumbering. It is Route 255. LRN 296 ==> ==> ==> ==> LRN 296 was defined in 1963, but the change did not take effect due to the great renumbering. It is Route 254.